Each of these storage units features sturdy KIDZStrong hardwood construction with a tough KYDZTuff finish and KYDZSafe edges. These units move easily — they're mounted on casters for easy mobility. Lifetime warranty. 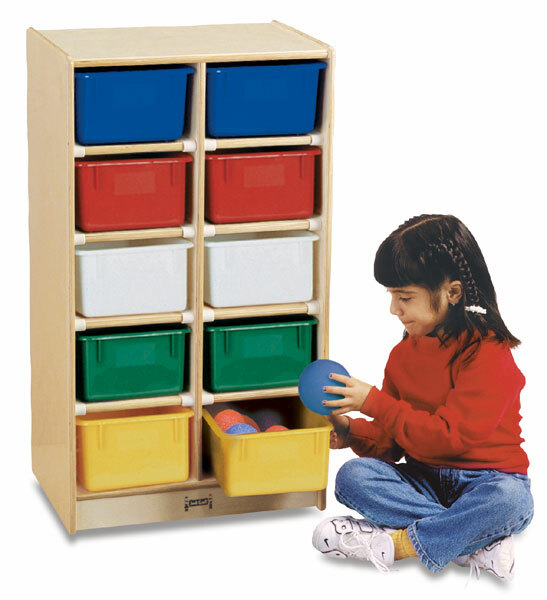 Mobile Storage Unit with 10 Trays — Ideal for smaller classrooms or limited space, this unit measures only 35½" H × 20" W × 15" D. It includes two each of standard cubbie tray colors: red, blue, yellow, green, and white. Cubbie holes measure 5½" H × 8¾" W × 14" D. Pegboard recessed back. Mobile Storage Unit with 30 Trays — This is maximum mobile storage for even the largest classroom. The unit measures 35½" H × 57½" W × 15" D. It includes six each of standard cubbie tray colors: red, blue, yellow, green, and white. Cubbie holes are 5½" H × 8¾" W × 14" D. Pegboard recessed back. E-Z Glide Fold-n-Lock Storage — This spacious locking storage unit features 20 handy cubbie trays. It opens to reveal both the cubby storage and the shelving space. Each half measures 29½" H × 48" W × 15" D. When closed, the unit measures 30" deep, and 48" W. Open, the entire piece is 8 ft long. It includes four each of standard cubbie tray colors: red, blue, yellow, green, and white. Cubbie holes measure 5½" H × 8¾" W × 14" D. Pegboard recessed back.